A-frames make great huts for small animals. Inexpensive and easy to construct, the steep angle discourages goats from climbing on top. Two people can move the lightweight structures easily so you can experiment and find the spot that suits your critters. 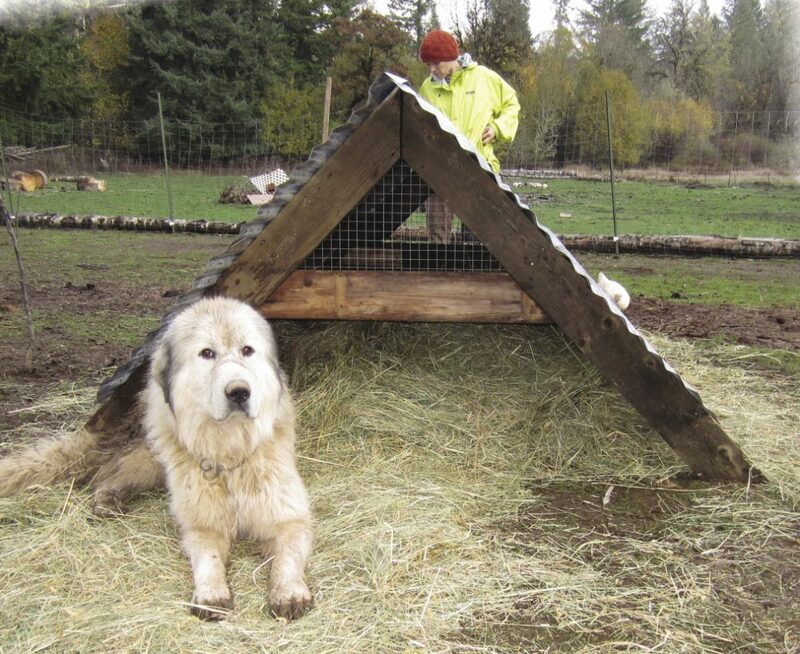 Easy-to-build A-frame huts make fine shelters for small and medium-sized homestead animals. Just fasten together 2×6 (or 2×4) boards in the form of the letter “A” for the legs, making the joint at the peak secure by using a piece of plywood. Use a 2×6 as a cross-piece further down to make the leg assembly very strong. Then join two pairs of legs together at the peak with an 8-foot 2×6 acting as the roof ridge. Cover with galvanized corrugated roofing and you have a handy hut. We used “treated” 2x6s because they last longer when exposed to weather, especially if you place the feet on inexpensive concrete pavers. Vary the height of the hut to suit the animals, making it just taller than the animals to help them retain their body heat in cold weather. Standard 8-foot 2×6 lengths make about the right size legs for goats and pigs, while about half that size are tall enough for fowl. 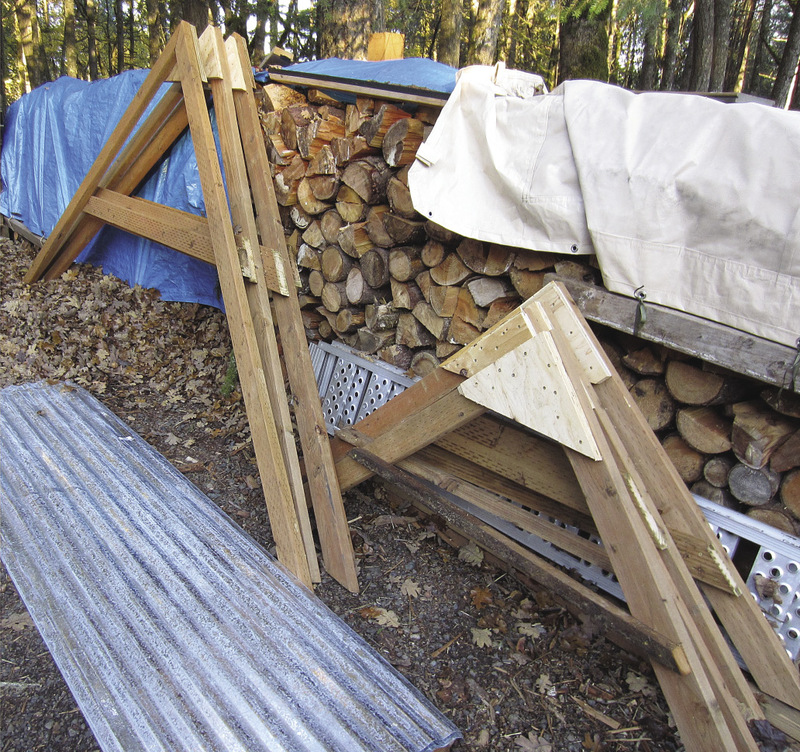 The huts are lightweight, so two people can carry them from place to place on your homestead. The steep angle and slippery surface of the metal roof discourages goats from climbing on the roof. The galvanized metal resists rusting. Use all-weather (rust-resistant, coated, galvanized, etc.) screws or nails. We used 2½-inch screws because they’re easier to remove than nails if you make a mistake. Dave cuts 45-degree angles on both ends of the legs. 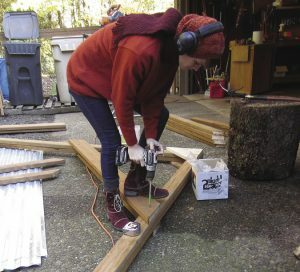 Annie fastens a 2×6 cross-piece to a set of A-frame legs. Note the plywood piece joining the peak. It’s 1¼-inch plywood, which we happened to have on-hand, but ½ or ¾-inch will do fine. One set of legs is resting atop a second set. 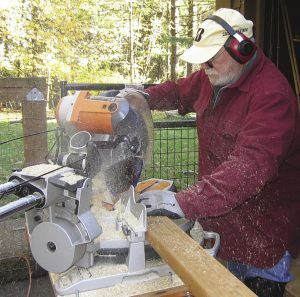 Sets of A-frame legs can be quickly cut and assembled in various sizes. These were built at Dave’s house, then assembled into huts on Annie’s farm. 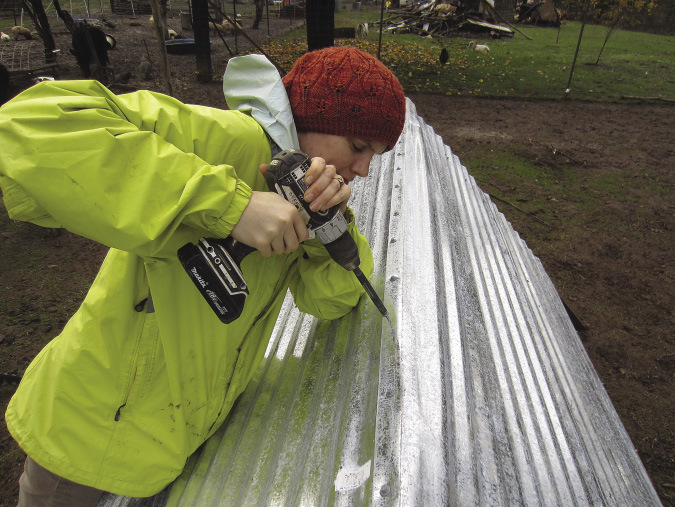 Annie screws on folded-over galvanized corrugated roofing using standard metal roofing screws. The screws come with rubber washers already attached and prevent water from leaking into the hut. A hammer comes in handy when coaxing the metal roofing to fold over properly.